Ugg boots are very comfortable and very popular, but they are not stain resistant. The soft, suede finish on these boots makes them "soak up" stains and marks. 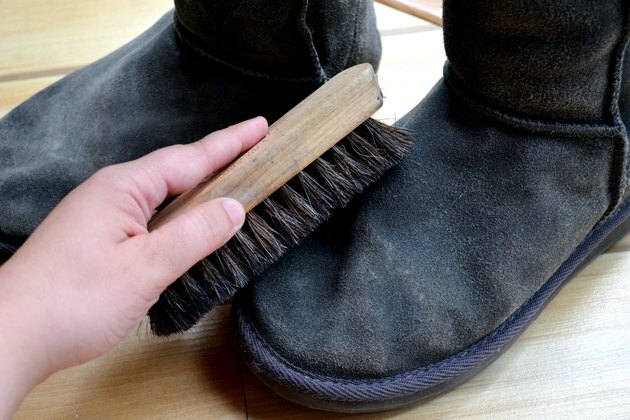 If you want to use your Ugg boots as boots rather than relegating them to house slipper status, then you will be relieved to learn that most stains can be removed from Uggs with the proper treatment. 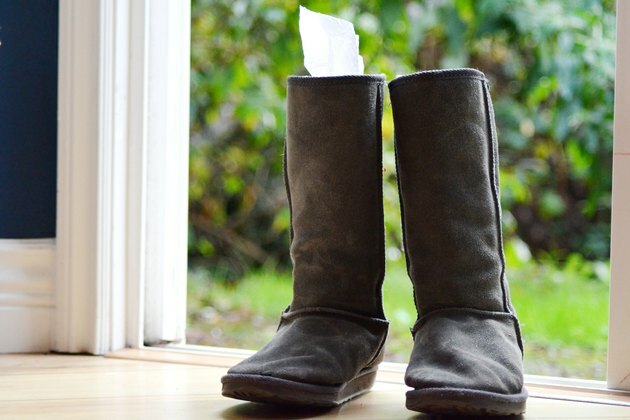 Stuff the boots with paper towels. This will help them hold their shape while the exterior dries after cleaning, and it will also make it easier to work with them. Brush the boots with the suede brush. In many cases, this will remove most crusty stains. Brush in one direction -- with the nap -- and use firm pressure. 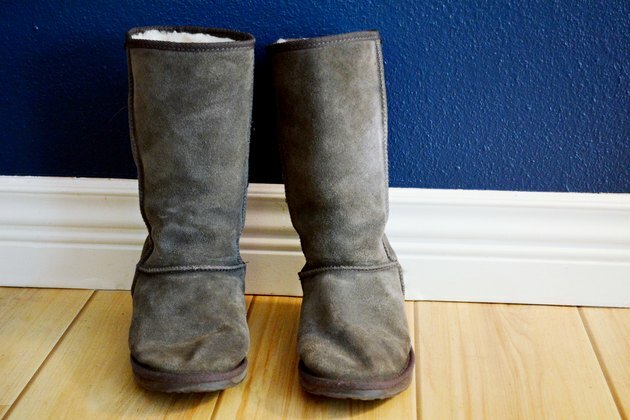 Never brush wet Uggs or wet stains because this can exacerbate the problem. Mix a cleaning solution. In the small bowl, combine 1 cup of cold water and 2 drops of mild liquid dish detergent. Use the sponge to swirl the liquid around, but you do not need to create a lot of suds. Tackle dirt and mud stains with the damp sponge. The sponge should not be so wet that it is dripping or soaks through to the inside of the Uggs. Use the sponge to dab at the stain. The liquid detergent should lift the dark spot right off the fabric. If it does not, add a drop or two of liquid laundry detergent directly to the sponge, squeeze to spread it out and apply it to the stain. 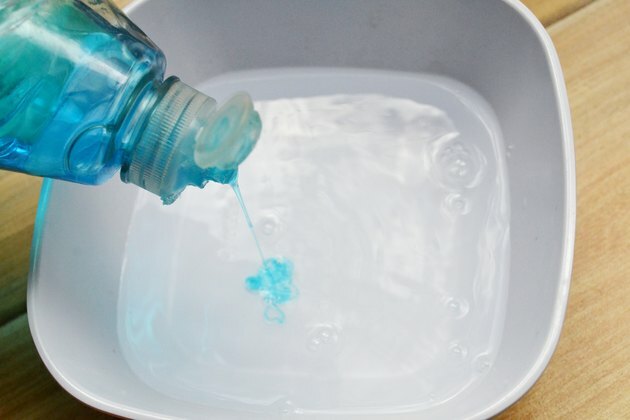 Use baby powder to remove oil stains. Sprinkle some baby powder on any oil stains. Cover the stains completely. 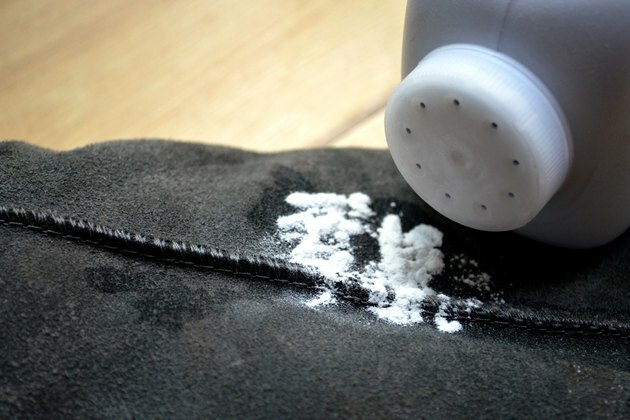 Leave the powder on the stains for 24 hours and then brush it off using the suede brush. You may have to repeat the process several times to remove all of the oil. Brush the Ugg boots with the suede brush. 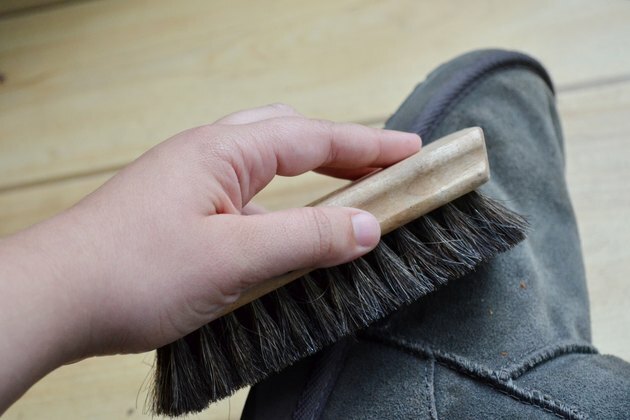 If you have washed any part of the boots, you must let them dry before brushing. Brush with the nap using firm strokes until your boots are uniform in color once more. Never wash your Uggs in the washing machine or dry them in the dryer. It will cause irregular shrinking and distortion of the boot fabric.